• U.S. News and World Report 2015 and 2014 rankings: "Top 20 Best Hotels in the U.S." and "#1 in New Mexico"
What Kind of Hotel is The Inn of the Five Graces? The hotel is amidst of Santa Fe's downtown, three blocks from the central Plaza. The hotel is situated in the oldest urban neighborhood of the United States, Barrio de Analco. Why Choose Santa Fe in the First Place? New Mexico’s beautiful capital is a richly flavorful place with its own mix of traditions: Pueblo tribes, Old Spain, Wild West, the arts and New Age. Visiting Santa Fe is like going to another country. 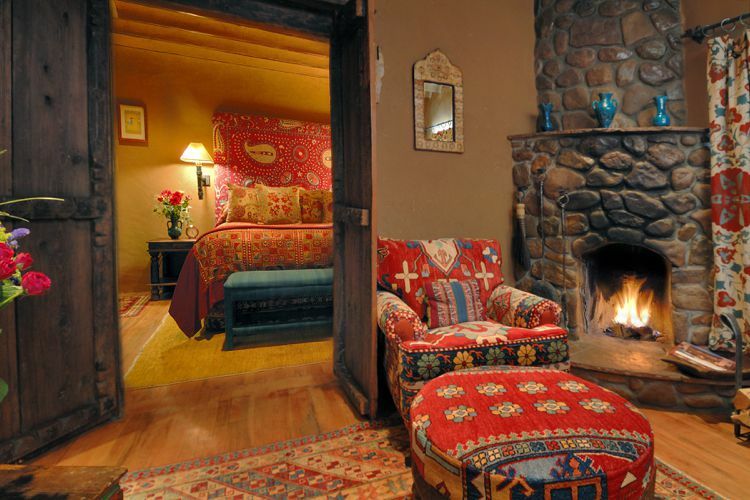 Will The Inn of the Five Graces Be Your Santa Fe Hotel Style? Is The Inn of the Five Graces the Right Santa Fe Hotel For You? The Inn of the Five Graces occupies some of the oldest residential buildings in the United States, and its style is completely unique. The Inn of the Five Graces strives to fulfill guest requests for a particular suite. Why Does The Inn of the Five Graces Look So Exotic? The hotel's storybook look did not arise overnight. Its founder and owner, native New Yorker Ira Seret, is credited with popularizing the colorful ethnic look that became the reigning style of the hippie era. He relocated to Santa Fe in 1979 and opened Seret and Sons, an enormous showroom and store near the hotel. The Inn of the Five Graces is furnished 100% by Seret and Sons. From your suite's hand-carved teak bed to its pillows and throws -- is a Seret-imported, imported, one-of-a-kind artwork. The hotel's 24 accommodations range from a house to rooms. But most guest quarters here are suites. Suites on the lower floor of the inn's two-story adobe buildings feature private or semi-private patios. Luxury travelers are connoisseurs of the good life. They crave the comfort of sumptuous bathrooms, and luxury hotels strive to indulge this passion. The Inn of the Five Graces wins. This hotel has just about the most beautiful bathrooms imaginable. These relaxation stations are huge and spa-like. • They offer a soaking tub, walk-in shower, a chaise lounge, and double sinks of sculpting stone like blue lapis or green serpentine. Every one of these bathrooms is lavished with mesmerizing art. It's everywhere: on the walls and on the floors, around tubs, in showers, on counters. You'll understand why each one has a reading chair or sofa: because you'll want to camp out in these havens of beauty. Unlike most Relais & Chateaux hotels, The Inn of the Five Graces does not have a restaurant. It serves only breakfast. Suites at The Inn of the Five Graces feature a mosaic-tiled dining nook. The Inn of the Five Graces is not a corporate affair. It is owned and run by Santa Fe's Seret family. The Inn of the Five Graces' staff delivers five-star hotel service. Like the inn's rooms, its spa is a fantasy environment. The inn's gym is remarkably spacious for such a small hotel. An outdoor pool suitable for lap swimming is open during the warm months, approximately June through mid-October. As is common in the travel industry, the writer was hosted by the hotel for the purpose of describing it. For details, see our site's Ethics Policy.